These lovely one, two, and three bedroom villas are set on Denarau Beach with each featuring a living room, dining room, and fully equipped kitchen. The villas are light, airy, and beautifully appointed. Guests have full use of the Denarau Golf & Racquet Club. 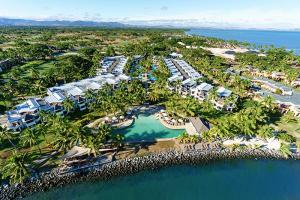 Enjoy the amenities and entertainment at the Sheraton Fiji and the Sheraton Royal Denarau Resort. Access to 11 dining options and 8 bars throughout the Sheraton Resort Complex, and guests can charge to room, suite or villa.